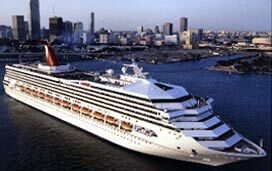 (11:30 a.m. EDT) -- A Carnival Destiny passenger jumped overboard yesterday into waters off the Florida coast and was quickly rescued by the ship's crew. In a statement provided to Cruise Critic, Carnival said witnesses saw the 29-year-old woman jumping off the ship at approximately 12:10 a.m. local time as it steamed for the Caribbean on the first night of a five-night cruise. Search-and-rescue operations were initiated and the passenger was located and brought back onboard, where she received treatment in Destiny's medical center. The ship also altered course yesterday to provide further care for the woman, docking in Key West for the day rather than the planned stop at Ocho Rios, Jamaica. However, the ship's call at Grand Cayman on Tuesday is expected to proceed as scheduled, Carnival said in its statement. The majority of person overboard scenarios don't end in a rescue -- but it does happen. In April, a man went overboard from Carnival Spirit on a Hawaii cruise and was rescued almost immediately. This past February, fast-acting crewmembers were able to rescue a crewmember who jumped off of Carnival Magic. Last October, a man who jumped overboard from P&O's Ventura was likewise pulled out of the water alive. More strangely, a Carnival Inspiration passenger who went overboard in June 2009 was rescued when he was found hugging a pilot marker in a shipping channel near Tampa. The man told authorities that he climbed up on a railing to get a better view of the pilot boat when he slipped and fell overboard.